Electricity generated by geothermal powerplants is expected to increase by 73% between 2010 and 2015. 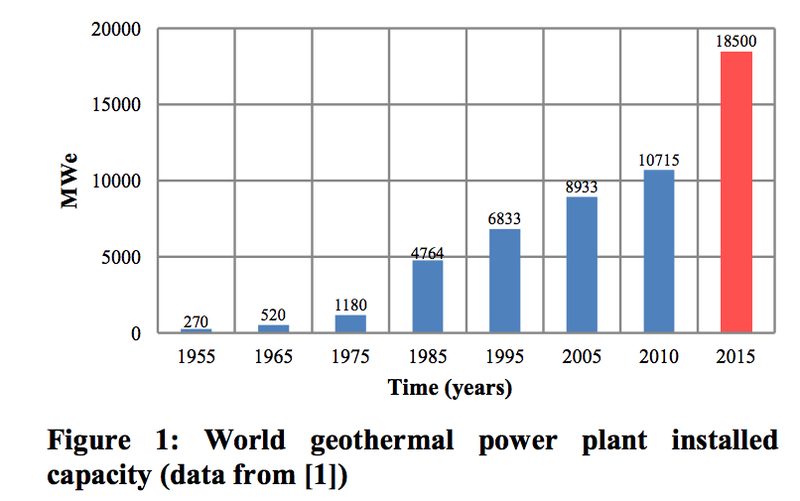 Image source: geothermal-energy.org. Most of the world’s electricity is generated using steam. Water is heated, generating high-pressure steam, which blasts out and spins a turbine. The turbine system creates motion of a magnet relative to wires, which in turn generates an electrical current, a phenomena Michael Faraday discovered in the 1830’s. Powerplants mainly differ in the heat sources they use to generate steam. The most common heat sources are currently coal, natural gas, nuclear, and oil. 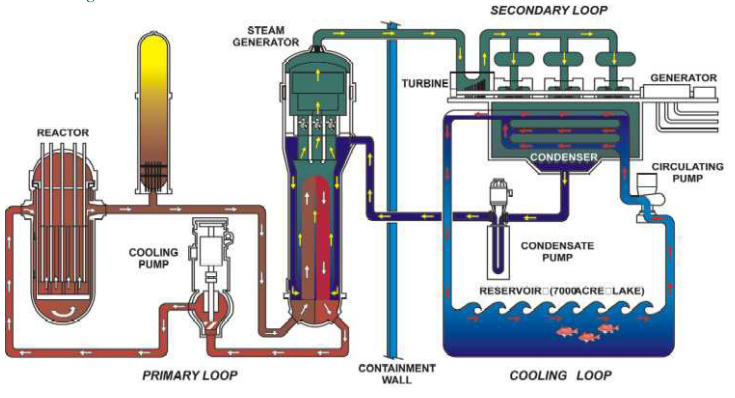 A schematic of a steam turbine powerplant is shown below, courtesy of the South Texas Nuclear Project. Schematic of a nuclear power plant. Notice how a closed loop of water is heated, passed over a turbine, cooled, and reheated. Image source: South Texas Nuclear Project. In the 21st Century, a growing trend is developing towards using geothermal heat sources. The amount of electricity generated by geothermal powerplants is expected to increase by 73% between 2010 and 2015. While geothermal powerplants are less efficient, they do have several advantages. The #1 advantage is they use the Earth’s heat. And beneath our feet lies an almost infinite supply of heat. Current geothermal powerplants are located where magma sources rise close to the surface. However, with improvements in technology, we should be able to access deeper and deeper heat sources. And, we can also vastly improve geothermal powerplant efficiency by using supercritical water(high pressure/high temperature) instead of steam. This was the goal of the Iceland Deep Drilling Project. In this first-of-its-kind system, they actually drilled into the magma, creating what is known as a magma-enhanced generating system. While the system is not currently operating, the project showed it is possible to use water near the supercritical phase, resulting in a much more efficient powerplant. The search for alternative energy sources continues as people become increasingly aware of the negative environmental impact of covering vast expanses of Earth’s surface with wind turbines and solar reflectors. God commanded us to be good stewards of His creation, and covering the land with windmills and solar reflectors is not a good management solution. Hopefully, cities and states will continue looking more and more at geothermal systems, with their small environmental footprint and low emissions. This entry was posted on September 2, 2014 at 10:07 am and is filed under Teaching Science. You can subscribe via RSS 2.0 feed to this post's comments.